Risk vs. reward – The human body is tough, but not designed to fall from heights. Pick your climbing trees carefully. A man’s body was discovered Wednesday morning along the shoreline next to Glacier Creek at the base of a rock outcropping, roughly 200 feet down from Alberta Falls. Rangers reached the body about 30 minutes later and confirmed that he was dead. There were no witnesses and the incident is under investigation, but foul play is not suspected. The man’s body was flown to a landing zone near the Glacier Basin Campground and was transferred to the Larimer County Coroner’s Office. On Tuesday, September 16th, rangers participated in the successful rescue of a 67-year-old man from San Jose whose plane crashed in a remote area of Sequoia National Park. The plane was reported missing when it failed to arrive as scheduled in Lone Pine, California, on Monday afternoon. The park was notified around 3 a.m. on Tuesday morning that a transponder signal had been traced to the Forgotten Canyon area of Sequoia National Park. At approximately 9 a.m., the wreckage was spotted near Funston Lake by the Civil Air Patrol and visual contact was made with the pilot. The park helicopter was used to insert a parkmedic and investigators at the crash site. The pilot was treated and transported to the Ash Mountain helibase, where he was transferred to a waiting SkyLife air ambulance and flown to an area hospital. The National Park Service is coordinating the investigation into the cause of the crash with the National Transportation Safety Board and Federal Aviation Administration. The California Office of Emergency Services and Tulare County also assisted with this search and rescue operation. 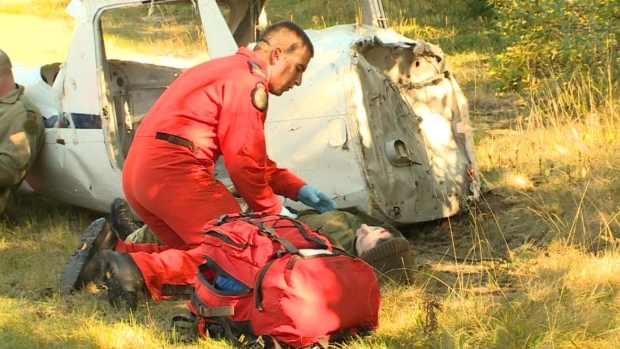 This entry was posted in Search and Rescue, Survival Weekly and tagged backpacking, hiking, Hunting, missing pilot, plane crash, water safety, wilderness medicine, wilderness survival, wilderness survival stories on September 21, 2014 by bigpigoutdoors.